Nefarious1 , Jennifer F. and 12 others like this comment. lindsey s. , Nefarious1 and 5 others like this comment. Hey Transformers! Love it! I am having serious sugar cravings. Seriously, I feel like Cookie Monster where he eats without chewing when he grabs them. Please help me I do not want to give in! lindsey s. , Nefarious1 and 7 others like this comment. Aldi has dessert hummus,. I know it sounds kinda weird. I love the brownie batter flavor. I eat a spoonful after dinner and it's the perfect sweet bite!! I started in Jan for new year's to stop eating sugar. I read labels and if sugar in any form is in the first 3 ingredients it's a NO-NO. The dessert hummus fits into my guidelines, I think sugar is fourth or fifth in the ingredient! Good luck, one small change at a time will prove worth it! How was your Wednesday? What was your favorite part of today? What are your favorite veggies? I love roasted brussel sprouts the most! 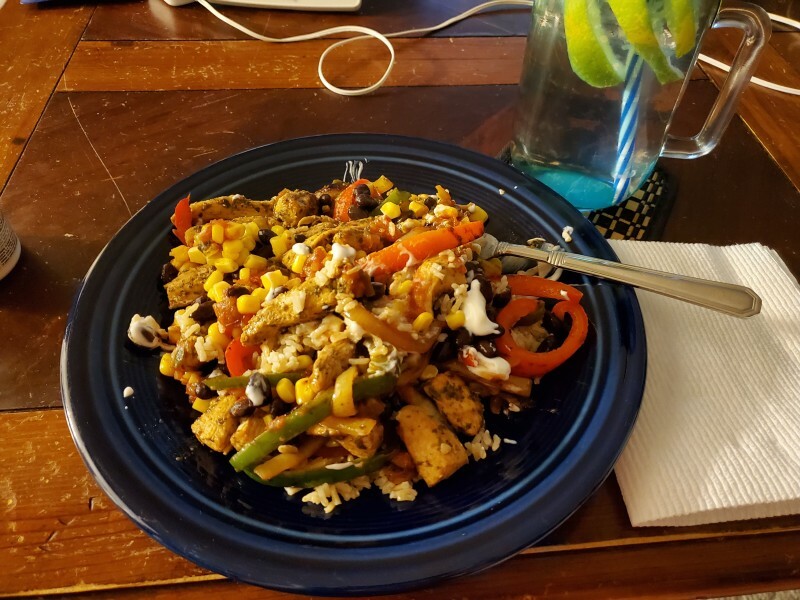 Chicken fajita burrito bowl ... what's for dinner in your house? I'm ready to change it up and get new food ideas! lindsey s. , Nefarious1 and 14 others like this photo. Seriously looks so good! Adding to my food calendar for sure! 04/10/2019 6:07PM in Amazing April Transformer - Win a Peloton Bike! I’m starting Keto to try to get healthy and lose weight. My blood pressure is borderline high and cholesterol is high too. Here is to a new healthy me 6 months from now! Let’s cheer each other on!!! We can do this!!! lindsey s. , Nefarious1 and 17 others like this comment. lindsey s. , Nefarious1 and 10 others like this comment. Turned 25 yesterday joined this as my birthday gift to myself, I'm amped and ready to go! Hi friends! This is my first diet bet & im pumped! I was diagnosed with super high cholesterol & type 2 diabetes about 6 weeks ago. I’ve lost 23 lbs so far & im feeling great!! 23 lbs so far! Congratulations! I'm trying to slim down for my wedding October 18. I'm at 256 pounds and feel horrible. I haven't ever been able to shed pounds. Only gain in spurts. I hope this motivates me to eat healthier. I walk 5ks regularly with my fiancee. Eating is my downfall and eating better is the only way I can lose weight. I love working out, but it only adds muscle and makes me feel good, not lose fat. I don't know where my motivation went, but I can't seem to even care about eating better anymore. But dietbet appears to be working for a lot of people. I guess I'll see. If this doesn't motivate me, I don't think anything will. lindsey s. , Nefarious1 and 18 others like this comment. The accountability of DietBet is great - I started tracking calories and watching what I eat and it has helped me a lot. It’s a big commitment and I’m pleased with the results so far - I use Noom. thanks everyone. the requirement of eating vegetables before eating something unhealthy seems like something I can do. I feel better eating veggies but I couldn't get myself to want to eat them anymore. Since I eat junk alot, this will really increase how many veggies I eat and relieve guilt. I'm sure it will end up having the effects Jennifer described. Thanks for sharing that advice.